As a marketer and business owner, you want to maximize the amount of traffic, leads, and sales you get from search marketing. To do this, you must give searchers and search engines what they want. The key for both marketers and search engines is understanding the mindset of searchers. By understanding what motivates searchers, marketers and search engines can serve them better. People use search engines every day for everything from researching a school project to looking for reviews for a big-ticket purchase like a car or home. What motivates searchers is simple: They want to find the most relevant, highest-quality web pages about anything and everything they’re searching for, and they want to find those pages now. If marketers and search engines can satisfy searchers, everyone wins. Searchers find what they want; marketers get traffic, leads, and sales; and search engines gain users. A search engine company, such as Google, is a business, and like any other business, it must generate revenue to survive. As a result, it’s useful to understand how search engines generate that revenue. If you understand what motivates the search engine, you can plan your search strategy accordingly. Most search engines generate most of their revenue by selling advertising. Check out this typical set of advertisements in a Google search results page. 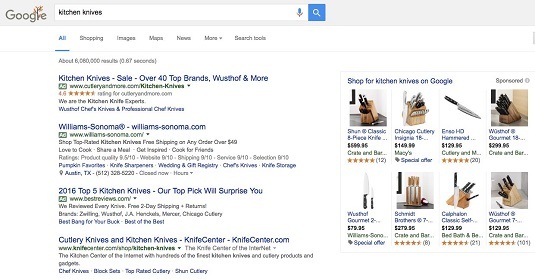 Google displays ads at the top and in the top-right corners of search result pages. As a result, it’s in a search engine’s best interest to serve the best, most popular, most relevant content to searchers. Failure to deliver what searchers want sends those searchers elsewhere to find what they’re looking for, which means less opportunity to show ads. Other search engines generate revenue by establishing affiliate relationships with the businesses to which they refer traffic. When a searcher visits one of these affiliate partners and makes a purchase, the search engine makes a commission on that sale. If you want to build a successful search marketing campaign, you need to stay within the borders of each search engine’s terms of service. Search marketing tactics that violate those terms of service are called black-hat; those that play within the rules are called white-hat. Black-hat search marketing tactics are not only unethical (and sometimes illegal), but also bad for business. Violating the terms of a search engine may create short-term results, but those results won’t be sustainable. Search engines like Google continuously update the algorithms they use to rank websites in an effort to squash black-hat methods such as link buying and keyword stuffing. Marketers who use white-hat search marketing strategies — those who follow the search engine’s terms of service and build a better user experience for searchers — are rewarded with higher rankings and more traffic, leads, and sales from search engines.